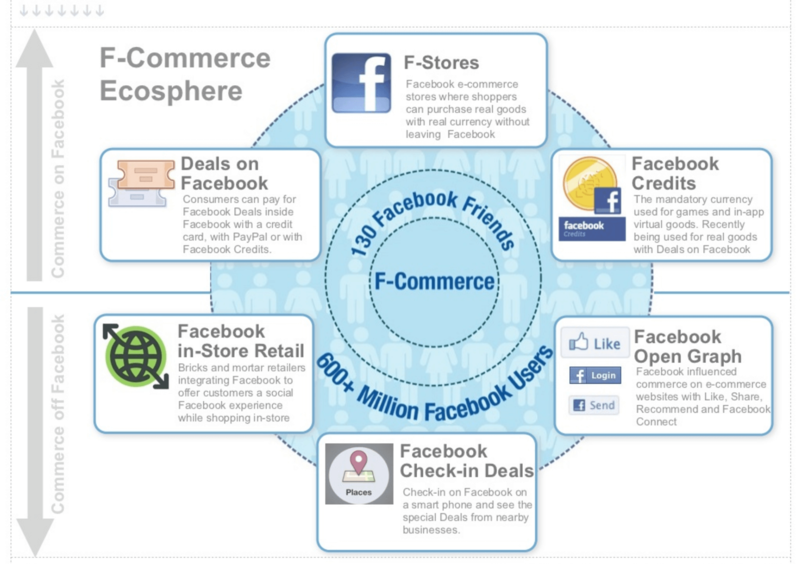 Janice Diner made a useful infographic summarising the current ‘ecosphere’ f-commerce and the six ways in which vendors are selling with Facebook. It’s a useful snapshot of the fast-evolving world of f-commerce, and similar to that outlined in our f-commerce FAQ. It differentiates two basic forms of f-commerce – f-commerce where transactions take place on Facebook itself and f-commerce where transactions take place elsewhere (in-store, on external e-commerce sites). This is a useful distinction. In the context of Facebook, the term ‘f-commerce’ is new, and an accepted industry-wide definition has yet to emerge. 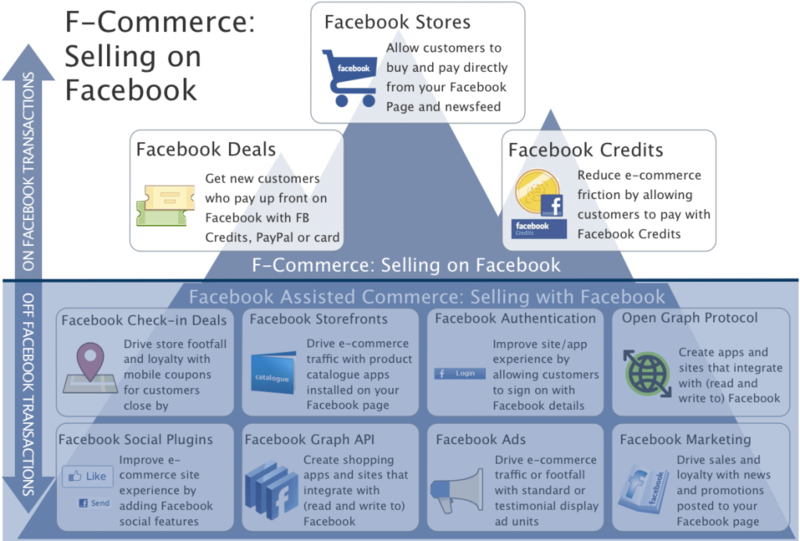 Nominally f-commerce describes the range of activities in which Facebook is used to assist in the buying and selling of products and services. In this sense, f-commerce is a subset of social commerce – the use of social media, online media that supports social interaction and user contributions to assist in the buying and selling of products and services. Like the term social commerce, f-commerce is used to describe a range of different activities, all related to buying and selling on Facebook. The useful distinction made in the infographic – on/off Facebook transactions, provides a way to organize everything that passes for f-commerce. We’d propose extending off-Facebook f-commerce tools to include the range of developer tools that can be used to facilitate commerce – and we’d remove the “Facebook in-store Retail” entry, because unlike the other five elements in the ‘ecosphere’ is not a tool itself, but a bundle of tools that can be used in the context of in-store retail – including Facebook Check-in Deals and the Facebook Open Graph. Thus we’d be tempted to replace “Facebook in-store Retail” with “Facebook Storefronts” (that allow page visitors to browse but not buy on Facebook) as well as other developer tools for Facebook Assisted Commerce, including social plugins. Perhaps this messes messed up the pleasing visual symmetry of original infographic, but it’s a little more complete. Facebook Marketing – the use of Facebook as a tool for sales promotion – ads, apps and newsfeed posts designed to drive traffic to Facebook stores, site-based e-commerce stores, or traditional stores. For example, Walmart installed a promotional app on its Facebook Page to drive in-store traffic by offering deals that would only go live once enough people had liked (i.e. shared) them. Similarly, Estée Lauder uses Facebook to drive footfall to store by advertising promotions such as a free set of Facebook profile photos, following a complimentary in-store make-up session.